Travels Along the Mekong: Quietest Capital City in the World? Vientiane, Laos - That would in fact be Vientiane the capital of Laos. We spent the last 4 days in the capital and actually didn't do too much. We saw a couple of wats, walked along the Mekong but mostly just spent two days getting our Thai visas. Vientiane is a pleasant enough place and very quiet especially compared to other SouthEast Asian capital cities but then there are only 250,000 people in Vientiane. As I mentioned we had to get visas for Thailand as the Thai governmennt in their infinite wisdom decided to crack down on people living illegally in Thailand by changing the visa rules a couple of months ago. 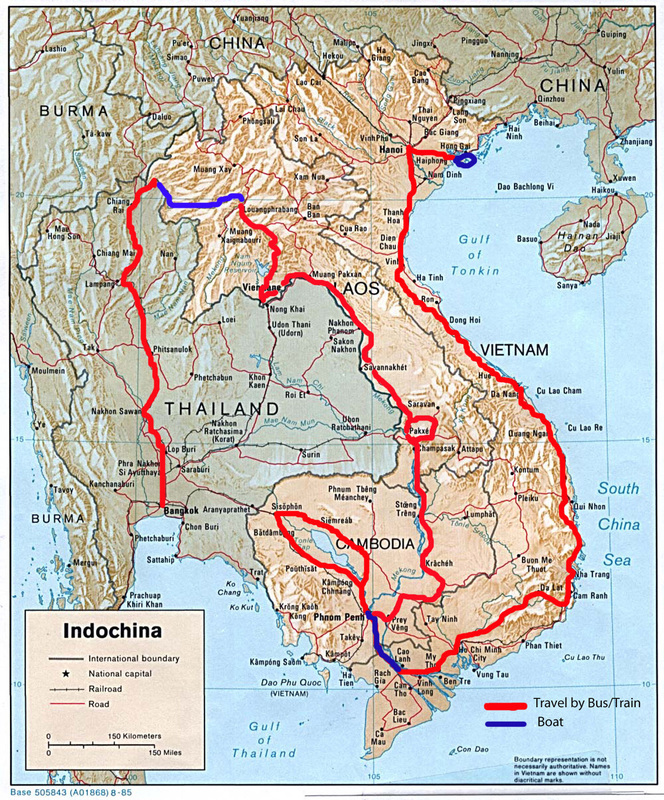 Previously if arriving overland into Thailand you were automatically granted a 30 day visas (most western/asian countries) however a lot of guys were staying in Thailand for months if not years and just doing runs to the border with Laos, turning around and getting a new 30 day visa. Thailand decided to combat this by changing the visa rules so that you can only get a 15 day "visa on arrival" when crossing overland. This would frustrate the guys living in Thailand and force them to leave. What is has done instead is inconvenience every traveler crossing overland and forced them to get a visa ahead of time and waste at least 2 days doing it. Maybe a better solution would have been to limit the number of visas a person could get in a year? That would stop the perennial overstayers yet not impact tourism. Better be careful, we don't want logic to get in the way of any decisions. Anyhow Monday morning we lined up to get a visa took about 3.5 hours, then came back the next day and waited another couple of hours andpicked up our passport. Painless process, didn't cost any money just was a waste of time.